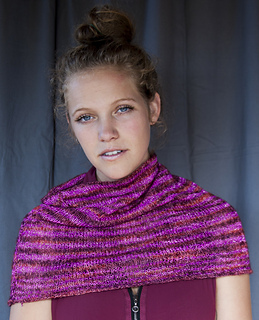 Alchemy Yarns’ simple striped cowl blends two fabulous yarns together to a dazzling effect. Sparky, made of pure silk ribbon wrapped with a subtle golden sparkle, glimmers dramatically against Tweedy, a beautiful silk/cotton/mohair blend. The contrast of the two textures creates an inimitable fabric, decadently soft, and nuanced with color. The yarns are worked in simple stockinette stripes in the round, with varying widths of stripes. The result is a delightful rhythm of texture and color, with a bit of optical illusion (the stripes look as if they undulate in thickness, given the textures of the two yarns in play). The cowl is graduated, making it wide enough at the bottom to cover the shoulders, and it is long enough to cover the head, as well. A versatile piece to be dressed up or down, the Sparky Cowl is just the accessory to say hello to a new season! 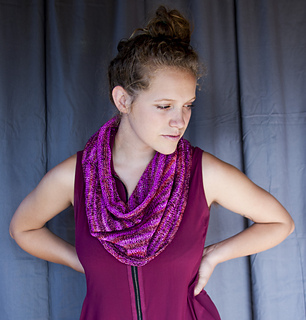 The Sparky Cowl is a perfect project for knitters of all levels. Knit in the round, it is worked entirely in the knit stitch; therefore, it is ideal for a beginning knitter. For the more experienced knitter, it’s super fun for a relaxing project, a knit-while-you-watch-a movie kind of pattern, or a great companion for traveling. The design is an awesome stash project as well, since it incorporates 2 different yarns (and could be adapted easily to multiple colors, with the knitter adding a different color stripe whenever it strikes her/his fancy). The design knits up in a flash on US Size 6 (4mm) needles, making it a wonderful gift knit. Addictive and truly satisfying to make, it’s only fair to say a word to the wise knitter: you may just have to make more than one! Think Silken Straw with sparkle! A pure silk thread wrapped in a subtle sparkle, Sparky creates truly unique fabric, maintaining all the qualities that make Alchemy Yarns Silken Straw world-famous. Dazzling & delicious, Sparky is super easy to knit, embraces a variety of gauges, and is just the ticket for the most elegant and sophisticated knitting.